Tamilrockers Kaala full movie: Tamilrockers, one of the most popular piracy website in India updated their Facebook page stating they will release Kaala full movie on Tamilrockers before the first-day first show. This has brought a new controversy to the movie and the crew. Earlier today, 45 minutes scenes of the movie got released on the internet and shocked the whole industry. A guy from Singapore did a Kaala FB Live stream and got arrested in an hour. The video has also been removed by Facebook as it was against their TOS. 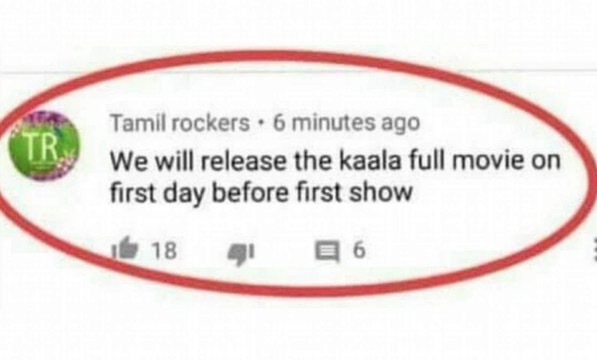 Now, Tamilrockers published a status on their Facebook and Twitter page stating Kaala full movie will be released on their website (new Tamilrockers URL) before the movie gets released in Tamil Nadu. In case if you get a Kaala movie download link, we request you to send a complaint email to antipiracy@aiplex.com with the download link. This threatens the first-day box office collection of the movie. If this happens, people will start downloading from online and film may face a huge loss all over India.